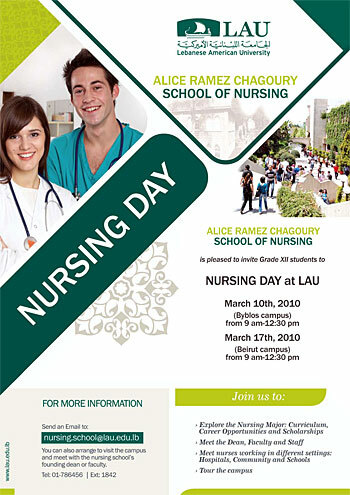 LAU’s newly established School of Nursing is organizing a “Nursing Day” on each campus (read about the Byblos-campus event), for high school students and current LAU freshman students. Explore the nursing major: curriculum, career opportunities and scholarships. Meet the founding dean, faculty and staff. Meet nurses working in different settings: hospitals, community and schools.